I LOVE anything coffee and thought why not cupcakes, seems simple enough, right? Line muffin pan with paper cups. In a stand mixer combine sugar, vegetable oil, vanilla extract, coffee extract, and milk mixture. Scrape sides of the bowl. Add baking powder, baking soda, and gluten free flour. Using a small cookie scooper fill paper cups 3/4 full. Fill pastry bag or ziploc bag and frost cooled cupcakes. Looks amazing!! Does the gf all propose flour have xanthem gum in it? 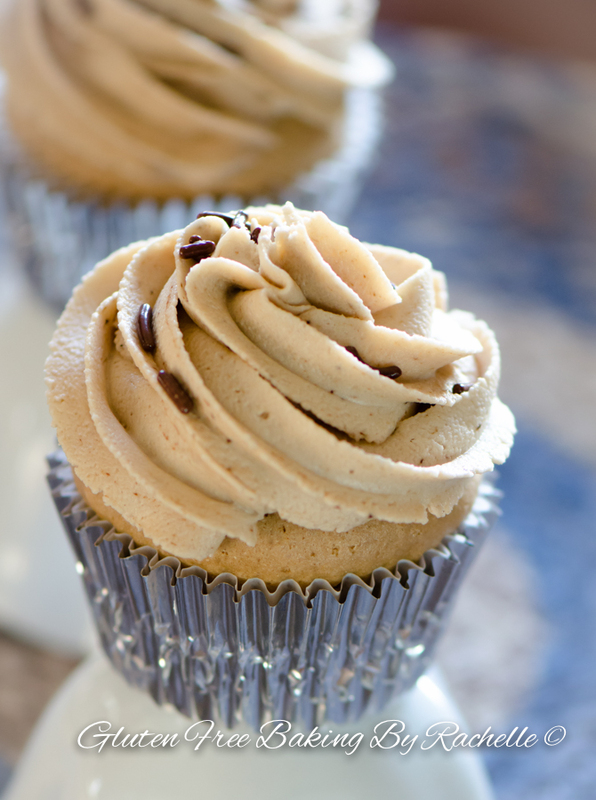 Looks really great.I want to eat them.After the reading this post I want to eat Gluten Free Vegan Espresso Cupcakes with Espresso Frosting.This is just amazing desert.I always love desert especially cup cakes.It is very easy to eat.During the outdoor trips I always borrow some fruit cup cake.I love cooking so defiantly I will make these cup cakes.But baking is one of my weak point,but I will make this one.Thank you for the post.This kind of post know about more recipes.